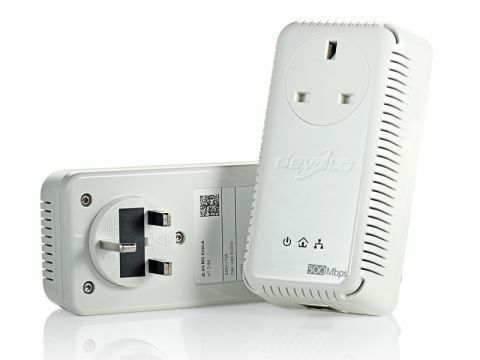 The Devolo dLAN 500 AVplus is great for creating a wired network without trailing cables across the house. Just connect your router to a nearby plug socket using one of the supplied homeplugs, and use the other with your Mac. Data passes between the plugs over your electrical cables, giving you a wired router connection anywhere in the house. These new plugs are capable of transfer speeds of up to 500Mbps, which is over twice as fast as the older dLAN 200Mbps apapters. Setup is easy, as long as you ignore the incorrect instructions and out-of-date wizard on the bundled CD: download the free Cockpit network manager from Devolo's website instead. The plug connected to your local computer is automatically detected, and others are added to the network by entering a unique security code printed on each homeplug. If you need extra plugs you can add them later, and the new dLAN 500 plugs are compatible with dLAN 200 units, albeit at 200Mbps transfer speeds. In our tests, the new dLAN 500 standard proved its worth, achieving speeds of 450Mbps and higher on our home network. Devolo's older dLAN 200 plugs managed around 155Mbps. Streaming a 1080p movie proved difficult, with stuttering and pixellation evident, but two 720p videos streamed simultaneously without problems (it struggled with three). It's great to see more powerful homeplugs aren't much more expensive than the older ones too.